I have seen a lot of discussions here on what happens when using dissimilar metals. I work in an occupation where we do use dissimilar metals that have isolation with success. We have to use these combinations because of the unique rooms we build and service. However, as it relates to our aluminum boats, water can bridge that isolation and create havoc. Attached is a picture of a 2 year old aluminum clamp piece with a metal screw in it. This clamp was holding two wood panels laminated with sheet copper on them. Water came into the room about a year ago when their roof developed a leak and it collected under the panels. The aluminum is coated with a substance that is friendly to both the copper and aluminum. Water bridged that gap and the reaction began unnoticed until last week. 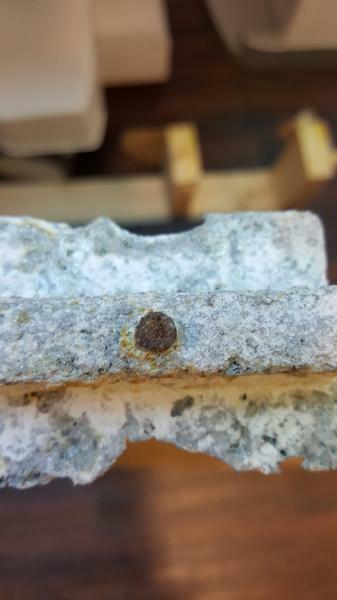 For anyone that is considering ignoring the advice of some of the longtime posters here that try to explain why dissimilar metals and pressure treated wood with copper phosphates are bad juju on aluminum boats, imagine that clamp is your hull of you boat. I have seen a lot of discussions here on what happens when using dissimilar metals. I work in an occupation where we do use dissimilar metals that have isolation with success. We have to use these combinations because of the unique rooms we build and service. Has your business ever tried Tef-Gel? That is what the US Military, specifically alledgedly the Navy uses. We do not use that, but I may have to get some to evaluate it for our purposes. It wouldn't do anything for the wood tho, it would still swell and the replacement costs would be the same. But for another type we build without wood, it may do the trick. Thank you. I think that as long as some of us immerse our boats in salt water, it is a never-ending battle to fight dissimilar metal corrosion. All of the liquids; washers and Goops still can't stop salt water from bridging the gaps. On another site, just this morning I read that, in Canada, they have approved a new treated "brown wood" for use with aluminum. It is not supposed to interact. Maybe my simple mind just doesn't understand it, but anything other than aluminum on aluminum is going to react somehow. I just read the Canadian fact sheet and it cautions that only stainless and galvanized screws should be used with "Brown wood". That should be enough caution for any aluminum boat owner. One of the techniques we use is placing a heavy tin foil between pieces if we have to go from aluminum to copper, brass or even steel. But for what I do it is supposed to be a dry environment. You mind is still sharp, no worries. Everything I have been taught in my field says the same thing. Unfortunately I have come across some real great examples of galvanic reactions. You would be amazed what liquid floor wax does between copper and aluminum. Point is with aluminum boats don't have any "gaps" to bridge. Keep everything aluminum or marine grade 316 stainless steel [using tef gel]. Not hard to do. If you use galvie, steel, brass, bronze, copper for any fittings you are asking for trouble. Nothing will bridge a gap in a marine or freshwater environment. When you work on wiring and use a stripper - clean up the copper pieces. Drop a brass swivel - pick it up.